Whether you pay tax on Vimeo purchases depends on where you are. For Plus, PRO, Business, and Premium membership purchases, we collect U.S. sales tax in Hawaii, New York, Pennsylvania, Virginia, and Washington. VAT (value-added tax) or GST (goods and services tax) will be applied to Plus, PRO, and Business purchases made in the following countries: Australia, Austria, Belarus, Belgium, Bulgaria, Croatia, Cyprus, Czech Republic, Denmark, Estonia, Finland, France, Germany, Greece, Hungary, Iceland, India, Ireland, Italy, Japan, Latvia, Lithuania, Luxembourg, Malta, Netherlands, New Zealand, Norway, Poland, Portugal, Romania, Russia, Saudi Arabia, Serbia, Slovakia, Slovenia, South Africa, South Korea, Spain, Sweden, Switzerland, Taiwan, Turkey, the United Arab Emirates and the United Kingdom. Non-profit organizations are eligible for tax refunds on their Vimeo purchases. If your tax-exempt organization was charged sales tax in New York, Pennsylvania, Virginia, or Washington, contact us for a tax refund. We will ask you to provide some official documentation showing your organization's tax-exempt status. If you are VAT exempt but live in a country where Vimeo collects VAT, you can enter a VAT ID while making new purchases or saving a credit card to your account. Just head to our upgrade page and select the plan you'd like, then continue to the checkout page. On the checkout page, if you select a country where VAT is applicable and exemptions are allowed, you'll see a link below "Choose your payment method" that says Have VAT ID? Click the "Have a VAT ID?" link and enter your VAT ID. Once your ID has been verified, VAT will be automatically removed from your purchase price. 1. 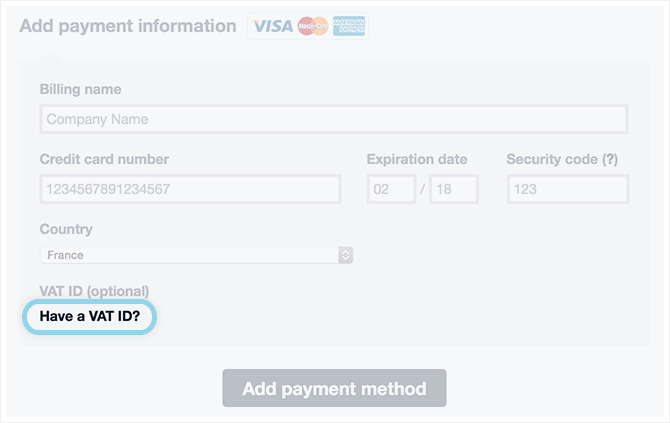 Log in to Vimeo and visit the Payment methods tab of your Billing Settings. 2. Click the "X" to delete any saved credit cards that aren’t currently being used for renewal. 3. Click "+ Add a new card"
5. Click “Have a VAT ID?,” then enter and validate your VAT ID. 6. Click "Add payment method"
7. Now select the new payment method in the dropdown menu in the membership section. If you are a VAT exempt business but forgot to provide your VAT ID during the purchase process, you can contact us for a VAT refund. Be sure to include your full VAT ID in the message. To request tax exemption for mobile in app subscriptions, we’d recommend reaching out to Apple Support or Google Play Support.